Oh Laphroaig, how I love thee. Since becoming a fan, every spring/summer I await the news of the new Laphroaig Cairdeas. Each year’s expression is different. It usually debuts at Feis Ile, Islay’s Music and Malt festival. Last year’s release was really nice – a throwback to how Laphroaig was made many years ago. The 2016 edition of Laphroaig Cairdeas is Madeira Cask finished. Many fans remember the 2013 Cairdeas release, a port-finished whisky. The excitement level remains high. I love wine cask finished peaty whiskies. The smoke and fruit combination just does it for me. Distillery Manager John Campbell took “fully matured” Laphroaig aged in ex-bourbon casks and moved the whisky to Madeira seasoned casks. There’s no age statement here, and no indication of how long the second maturation lasted. Rumor has it this is 8-9 year old Laphroaig. Doesn’t really matter, does it? This release is bottled at 51.6% abv, or 103 proof. It’s not for the faint of heart. Let’s get to the tasting. 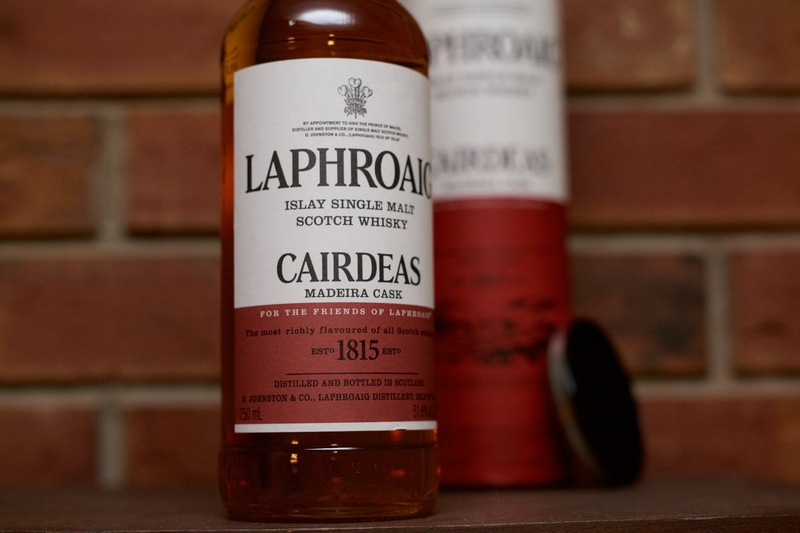 That Laphroaig “iodine” peat character is present in the nose, as one would expect. It’s joined by ripe red fruit, toffee and black pepper. At such a high proof, this whisky packs a little heat upon entry. Past that is a balancing act of bright citrus (fresh tangerines), smoke, seaweed and herbs (think rosemary). The citrus cuts through the heavy smoke, giving it some welcome vibrancy. The herbal notes sit right in the middle, along with toasted malt, cinnamon and light toffee. The long finish leaves behind spiced orange and a bit of smoke. Thanks to Laphroaig for the sample. As always, thoughts and opinions are my own.